Kicked the day off with a mocha at Peppy’s Drive-Thru Coffee. The staff were all smiles, having never seen anything quite like the rocket trike roll up to their window. Pedaled a few miles out of my way to get some shots of Xcel’s coal-fired power plant in Brush. Was then fortunate to catch Washington County Commissioner and geothermal expert Bruce Johnson at home (he’s someone I had met years ago assisting enXco with a proposed a wind project for Washington County), so I stopped by to talk to him. Have always liked Bruce, so it was really good to see him again. Then made a stop at the Akron News-Reporter. Bruce called ahead to the next town to alert Cheryl Patterson (co-owner of the Otis Telegraph) about me. She was kind enough to drive out to meet me to get a photo of the trike before the sun went down. 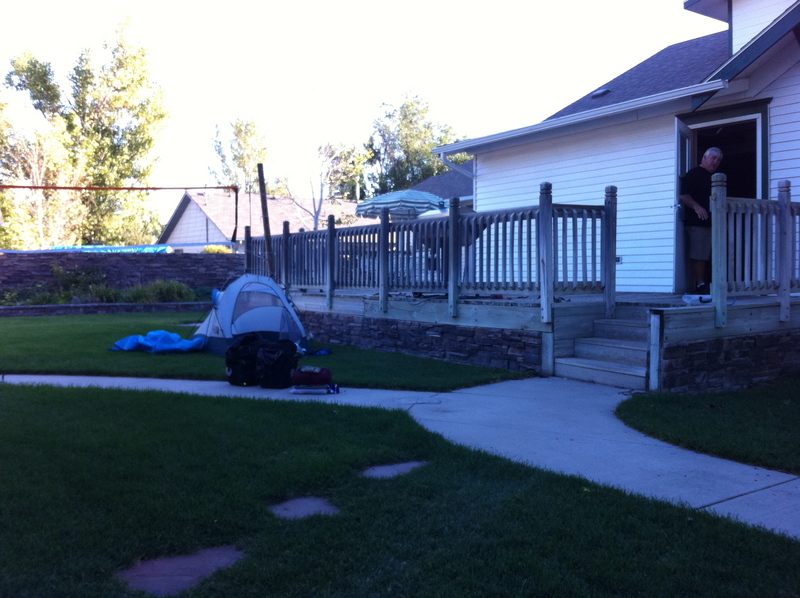 In response to my question about camping options in town, she generously offered her own backyard. The Patterson “campground” came complete with a laundromat, hot shower and a cat named “Snickers” (you might be able to find an amazing story about how their cat survived 16 days trapped under their porch by googling it in the Telegraph). Cheryl then treated me to dinner at a local Mexican restaurant, joined by her bubbly 4-year old granddaughter and teenage son. Another big ride day (87 miles). This entry was posted in 2010 Ride, Articles, Blog, Video and tagged brush news-tribune, coal plant, peppy's drive-thru coffee, ride for renewables, the fort morgan times, xcel. Bookmark the permalink.